As is by now traditional, a studio has bought the rights to a book that hasn’t even come out yet. 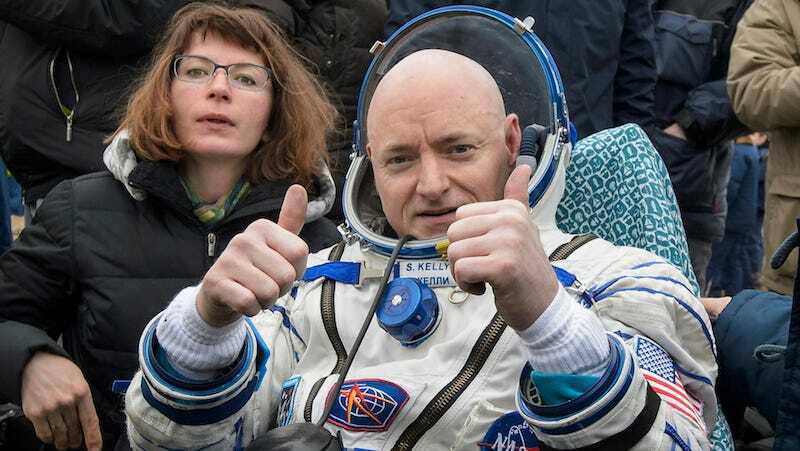 In this case, it’s Sony Pictures making a movie out of astronaut Scott Kelly’s Endurance: My Year in Space and Our Journey to Mars. Despite the title, the book isn’t all about Kelly’s 340-day stint on the International Space Station. It’s a full memoir, starting with Kelly’s youth struggling with Cs in schools, his time as a Navy test pilot, and the loving sibling rivalry everyone has with their twin who is also in training to become an astronaut. The movie rights come to Sony Pictures with Amy Pascal, Elizabeth Cantillon, and Rachel O’Connor producing. Also getting producing credits are Scott Kelly and his twin, Mark Kelly. Consulting on the movie are Margaret Lazarus Dean, the co-writer of endurance, and former congresswoman Gabrielle Giffords, who is married to Mark Kelly. It’s probably in no way weird to watch your life become a movie and not at all weird to help make it. Best of luck to both Kellys.